MACOMB — Setting up an application form for those who think a city property should be designated as a local historic landmark was discussed Tuesday by the Macomb Historic Preservation Commission. Chairman Dennis Danowski shared with commissioners various federal and state rules regarding the designation of historic landmarks. Vice-Chairman Allen Nemec noted that, though specifics for application were detailed in the materials distributed, Macomb has no application form to hand out. Danowski recalled that a draft was once created but it was never submitted to the commission for final action. Acting Community Development Coordinator Mitch Flynn said staff could prepare an application draft and have it to the commission for review in January. Nemec said he sees no need for additional information in the document beyond the guidelines received from the state. The vice-chairman said such a form could be used by the commission itself, by property owners, or by the McDonough County Historical Society. Nemec noted that property owners must agree to have their land or buildings nominated if they are not making the nominations themselves. Also discussed was the cost and wording of the historic plaque to be placed on any designated landmark. City Attorney Kristen Petrie said it would be a good idea to develop a consistent template for the wording on landmark plaques. "You might want to list the original developer or owner and the property's historic significance," she said. Flynn said that, from materials already received, an informational packet could be developed to give to anyone who takes out an application to nominate a prospective local landmark. He said a typical application fee is $100. Petrie suggested that the information and application to be developed about landmarks should also be scanned and posted on the city website. I gave that some thought and offer a differing view based on the following observations using the definition that the spirit of community can be measured by our residents contributing time, talent, and treasure. Individually or in clubs, organizations, and groups advocating improving the quality of life in our community. When I moved to Macomb in 1968, the local YMCA operated out of a second floor office space and served several hundred people. Today, the Y in our community serves over 3000 people from pre-school through senior citizens operating out of three buildings in Macomb and several programs in Bushnell. Five days a week the Macomb Y delivers over 100 lunch meals throughout the county. In just the last several months, three major fundraisers brought together our residents to support community projects. In five years VIBE, an all-volunteer organization, has raised and returned back over $550,000 to local organizations. The Performing Arts Society raised money for its Youth Performing Arts Series, which provides free bus transportation and concert performances for over 8000 school kids every year. The Purple and Gold auction raised money to support the WIU athletic teams, which entertain the sports fans in our community. Each year our community turns out in vast numbers to watch the WIU Homecoming parade, the Macomb High Homecoming parade, and the Heritage Days parade. Heritage Days is an opportunity for hundreds of former residents to return to their home roots and bind with their former classmates and community friends. Parades in Macomb embody the spirit of community. Every Thanksgiving hundreds of volunteers purchase food and prepare it for free dinners for local folks. The Eagles and Salvation Army invite anyone to attend. Soup and More does this once a month all year long. The Salvation Army depends on scores of volunteers to ring the holiday bells and collect donations for community programs. A statue honoring the social service of Macomb women was recently dedicated. The project succeeded because of the dedicated effort of volunteers soliciting donations throughout our community. Every year the Quality of Life Committee pays tribute to community members who have contributed to an improved quality of life in Macomb. Every semester, a corps of volunteers offers a wide variety of “classes” in the Learning is ForEver (LIFE) programs spanning a vast spectrum of interests open to all in our community. The Friends of the Macomb Public Library, another group of community volunteers, has been holding popular book sales to add resources for the library. Each book sale requires an army of volunteers to sort, setup, sell, and clean up. Travelers using the train station can find a free book to read, from the Friends of the Macomb Public Library. Another group of community members raised the money to purchase the former Woolworth building on the Square and turn it into the West Central Illinois Arts Center where one can see exhibitions, plays, or visit special events like the Festival of Trees. The Western Illinois Museum mounts three or four major exhibits each year featuring artifacts that reflect the history and community of our region. Volunteers from the community do almost all of that exhibition work. In that same building one can find the McDonough County Genealogical Research Center. Community volunteers answer family history questions that come from all over the world as well as walk-in inquiries. 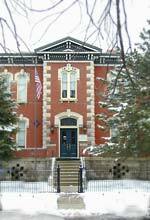 The McDonough County Historical Society often meets in the same building where volunteers promote the history of our community. The Macomb CVB facilitates and promotes many special events in Macomb, like the Balloon Rally every fall. The balloonists return annually for a sense of community they find in Macomb. The Western Illinois Regional Council depends on scores of community volunteers who donate time and money to make Project Santa a success. The City of Macomb has six boards and commissions that utilize the volunteer service of 40 citizens. Let me add the 800 flags of honor that are set up and taken down in Chandler Park by a community of patriotic volunteers every Federal holiday. And the July 4th Fireworks display celebrates Independence Day as a community gathering. And in the spirit of community, the Y, the Macomb Park District, the Macomb School District, and McDonough District Hospital are investigating ways to provide even more community-based activities and programs in a new central location. Let me close with a rapid thank you to a vast array of other volunteer groups which help glue us together as a community: Macomb Beautiful, Loaves and Fishes, Habitat for Humanity, Prairie Land Conservancy, Environmental Concerned Citizens, MDH Auxiliary, Friends of Argyle, Friends of Vishnu, Project HOPE, four Boy Scout Troops, Girl Scouts, Macomb Community Theater, Rotary clubs, Kiwanis, Lions, Altrusa, Elks, Emmet Chalmers volunteer fire department, McDonough Choral Society, State University Annuitants Association, WTND Macomb radio, free Go West bus and on demand transportation, supporters of WIUM our NPR radio station, several veterans groups, and an endless list of school activities supported by our community facilitated by volunteers. I am sure that I have missed some other examples of what I consider community spirit that seems to me to be alive and well in Macomb. I suggest that the glass of community spirit is not half empty but is overflowing. Gil Belles is a retired professor from Western Illinois University. Mary and George Hermann celebrated the installation of donor recognition plaques under the two trees they sponsored at the Rezab Family Prairie Meadow on West Adams Street south of the old Macomb Cemetery at Wigwam Hollow Road. One of the trees and plaques is in Memory of Judy Hermann, George’s first wife. The second is in Memory of William Lakie, Mary’s first husband. Both trees are White Oak (Quercus alba). The Rezab Prairie Meadow is an evolving tribute to the plants, grasses and foliage native to this area in the mid-1800s when the Old Macomb Cemetery was active. The McDonough County Historical Society cooperates with the City of Macomb in developing this meditative and contemplative entry to the Old Macomb Cemetery. Help wanted! Locate missing grave marker. 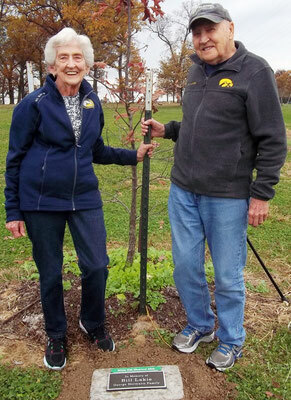 The cemetery project committee of the McDonough County Historical Society seeks the help of county residents in an attempt to locate a missing grave marker. The marker is very large and was last seen in 1968 or ’69. It marked the grave of the Civil War horse Chickamauga, who was buried in 1878 in the center of the racetrack on the old county fairgrounds south of Macomb. When the fairgrounds was abandoned, the large stone monument was neglected and seemingly lost. In 1968 and ’69, the land was being prepared for the Armory, MacArthur School, and a new, fourth, Macomb High School building. A local contractor, John Brown, uncovered the buried monument. He offered to restore the engraving and set up the two large parts for permanent preservation and display. But before he could move the huge pieces, someone else removed the grave marker. The Historical Society calls on our county residents to help solve the mystery of where the monument to Chickamauga might be. The horse was brought to Macomb in 1868, where the stories and legends of his Civil War service were spun. Chickamauga sired several winning trotters and reached celebrity status. When he died in 1878, he was buried at the fairgrounds. The McDonough County Historical Society began permanent and public recognition of the people who sponsored trees planted in the Rezab Family Prairie Meadow at the corner of W. Adams and Wigwam Hollow Road. 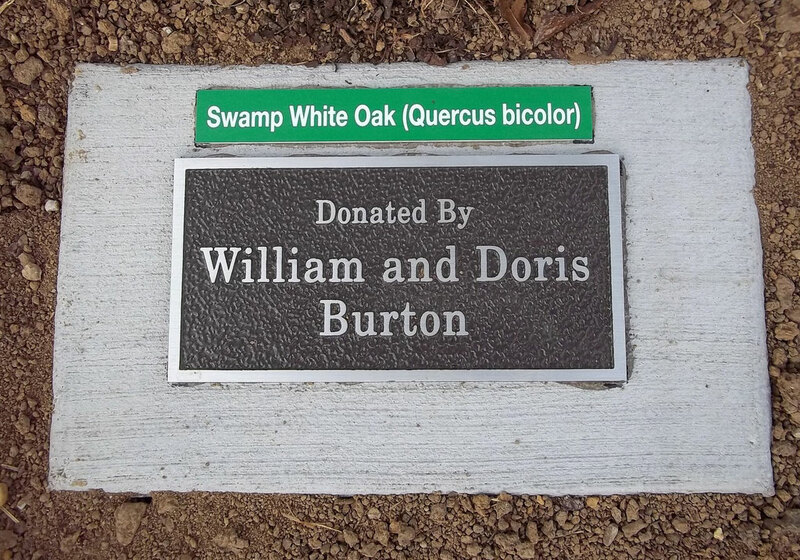 Bronze plaques with the donors’ names have been attached to concrete pavers near the base of the sponsors’ tree. The popular and biological tree names are also attached. 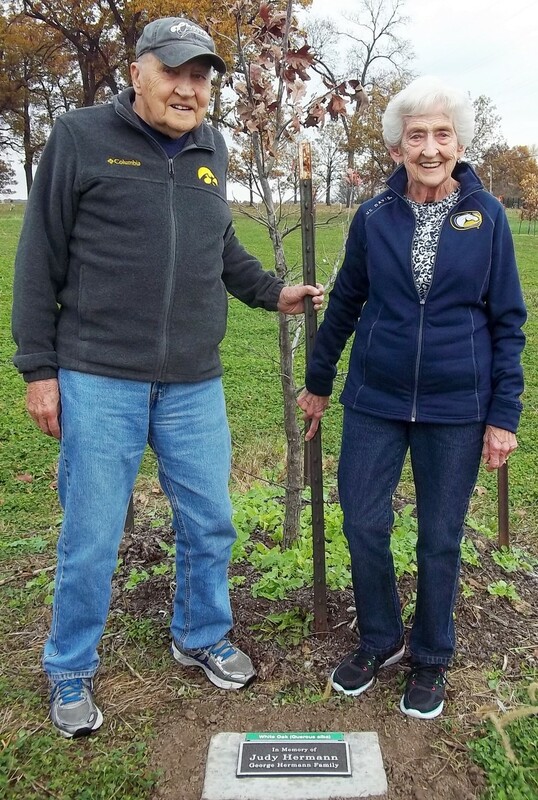 Bill and Doris Burton were the first couple to offer sponsorship of a tree, which was the first one planted in 2013. It is a Swamp White Oak (Quercus bicolor). 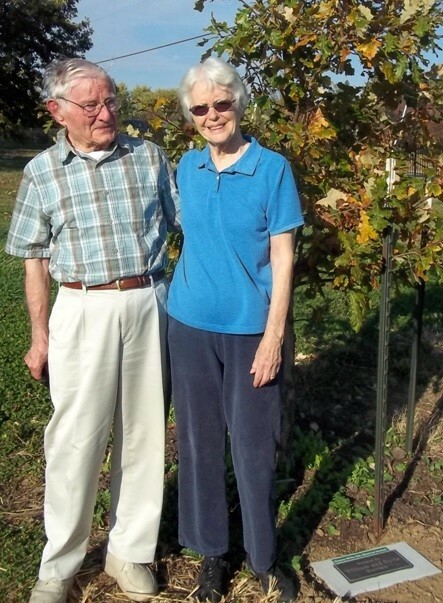 The Rezab Family Prairie Meadow honors the community contributions of Don and Gordana Rezab, both deceased. The pioneer prairie will evolve into a reflective and contemplative area south of the Old Macomb Cemetery. Margaret Ovitt, landscape architect, Tim Howe, Macomb Forester, and members of the historical society, work together to create a savannah prairiescape representing the native trees, bushes, and grasses growing in this area in the mid nineteenth century. It is a long-term process. When the project was approved by the city, the historical society solicited sponsors for the 14 trees planned for the design. Thirteen other donors quickly followed the Burtons. Each will be honored with a similar plaque. 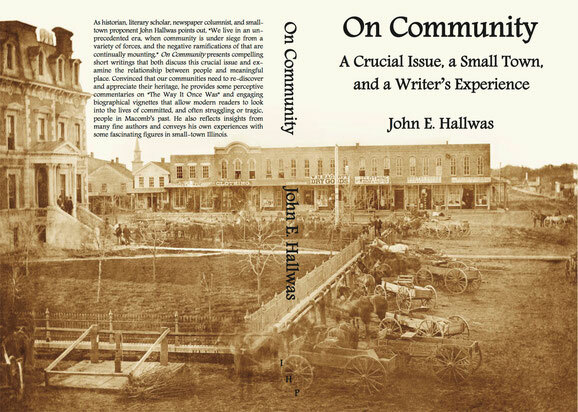 Historian John Hallwas has written many outstanding books about McDonough County, and we invite you to attend the introduction of his latest published volume, On Community. Since Dr. Hallwas is known for his thorough research and riveting presentations, this evening promises to be both fascinating and entertaining. At the meeting, autographed copies of On Community will be offered together with Society Memberships at a special discounted price. We encourage you to bring friends to our 7:00 pm meeting on Monday, November 9th, at the Spoon River College Outreach Center that is located at 2500 East Jackson Street in Macomb. Also, the date for membership renewal is approaching and the meeting on November 9th is a good time to renew. McDonough County Genealogical Society meeting. Oct. 19 at 7:00 pm. Speaking on “Old Forts and Block Houses of the Early Illinois". held April 25 at the Old State Capitol in Springfield. MACOMB — The city's historic preservation commission began a new chapter in its history Tuesday. "We've worked on the buildings around the square,"
said Chairman Dennis Danowski. "Now we're looking into historic neighborhoods." 42-block city laid out by pioneer James Campbell. apartments. A nearby home at 341 South Lafayette was built in 1852 for Wilson's daughter Elizabeth and her husband, Otto Clark. newspaper. The home was purchased by Carter Van Vlek, who was later killed in the Civil War. He displayed a photo of undertaker John McElrath's home, built in 1850 at 219 South Campbell with a front addition added in 1893.
to 1880. Willis Holmes built the property at 314 South Campbell in 1865.
a mill owner, built a home at 231 South Randolph in 1870.
which became an apartment house, was allowed to decay, and was eventually demolished in 2012.
has already gotten historic recognition for the Glenwood Park Shelter House and could try for recognition of other buildings. "We're not necessarily going to contact present homeowners," said Danowski, "but we do want to examine the historical records." 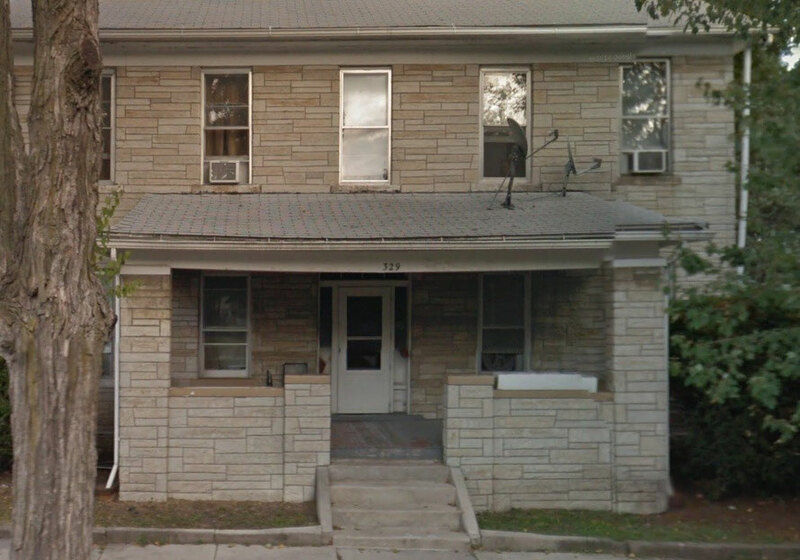 historic designation of the home of Macomb's first mayor, John O'Conner Wilson, at 329 South Lafayette St.
Reach Patrick Stout via email at pstout@McDonoughVoice.com. Once the median is removed, the city will patch over the area using concrete or asphalt and would restripe the parking spots. A proposed $3.5 million downtown revitalization project is on hold due to a delay in securing state funding. 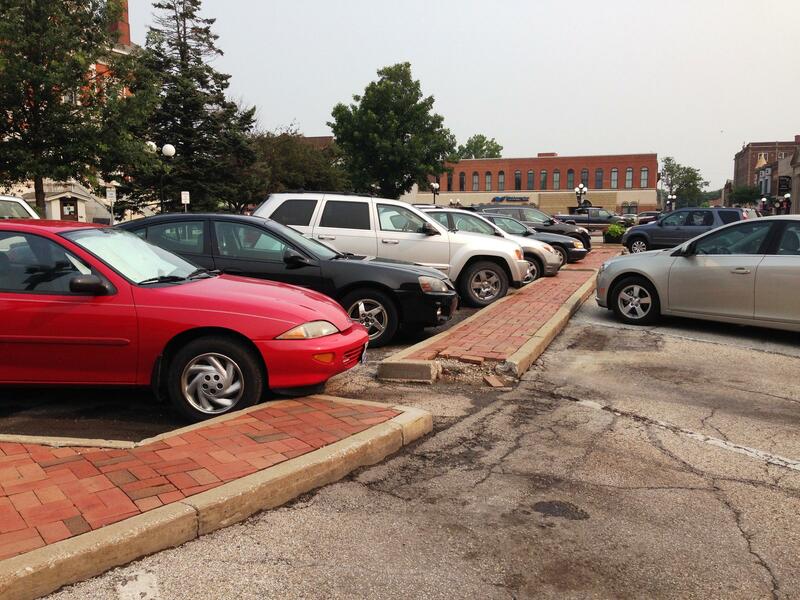 But Macomb won't wait to make at least one modification to the courthouse square. The city will remove the median that divides the inner rows of parking from the outer lanes and alter the parking configuration so that there are three rows of parking instead of four. The median is in bad shape and Mayor Mike Inman said it makes more fiscal sense to remove it than repair it because removal is part of the long-term plan for the square. And Inman said this will serve as a test drive for the proposed improvement plan. Inman said if the parking changes don’t prove beneficial, the city will consider alternative routes. Removing the median will mean a loss of 62 parking spaces on the square, a 20% reduction. “There may be occasions where someone may not be able to find a parking space but I think those occasions will be very rare and in that case, the parking lots are rarely if ever full. There are places within in a block to park and walk into the square,” said City Administrator Dean Torreson. McDonough County owns the inner lane of parking surrounding the courthouse yard and courthouse employees frequently park there on the weekdays. Still, Torreson said he believes there will be enough parking spaces 99% of the time. “One of the issues that has been talked about in the past is that the people that own businesses and work in the downtown park in front of their businesses quite often or maybe in front of a neighboring business. If they are concerned about that they could park off the square and help themselves,” Torreson said. The city estimated the work will cost about $125,000. Torreson said it’s money Macomb would have spent down the road anyway. The city said it checked with the state and was told the changes will not hurt its ability to receive state grant money to complete future work downtown. The median removal project will be done sometime this fall. Mayor Inman said the city will try to schedule it around events held on the square such as the Park and Cruise on Friday nights and Farmer’s Market hours on Thursday and Saturday mornings. Tim Schroll, property owner of Moses King Brick and Tile National Historic District, shows the roof of the factory beginning to weigh down. May 31 was the end date of a 90-day fundraiser to buy materials to fix the roof. 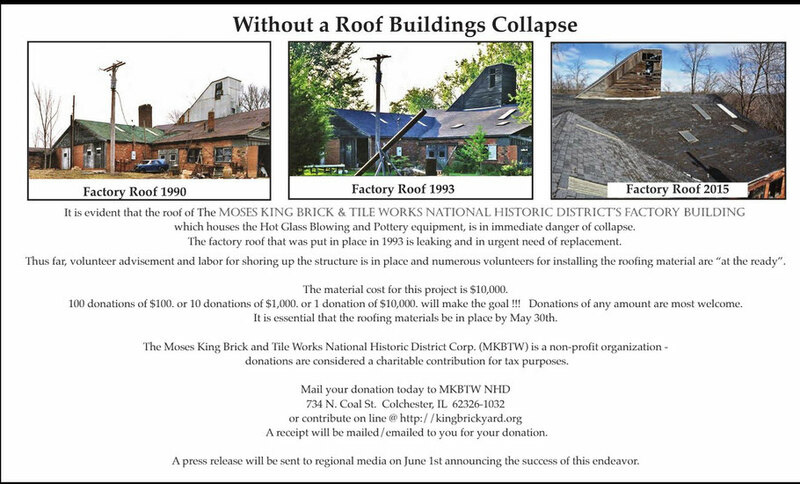 COLCHESTER — Moses King Brick and Tile National Historic District made its goal to rework support and structural impairments after a 90-day fundraiser. Dev, and her husband Tim Schroll, hit the $10,000 mark by midnight on May 31 to reverse dipping in — among other infrastructural remedies to — the factory roof. By May 29, two days before the fundraising cutoff, the Brickyard had received 76 percent of funds needed, according to Schroll. It was then a couple reached out to Schroll and Dev, saying they'd put up whatever was left on midnight on the end date. "In fact, we got the check today," Schroll said on Monday. Nearly 60 individual donations, varying in size: $10, $50, $100 and "a few" $1,000, came in to help repair the 1924 factory building. The monies came from locals, tri-county residents, regionals, and a few crossing state boarders. Schroll said that recently he had the structure work estimated, which came out to be $28,000. Realizing that amount of money wouldn't be realistic to raise, Schroll said he figured if he could get the materials covered, he could depend on volunteers. "We've always had good volunteer people," he said. "People come out here and get dirty and help and do." What the project needs exceeded the capabilities of the maintenance fund, Schroll said, as the Brickyard already struggles with that funding. However, because the King family sold the property to Schroll and Dev, he said they do not need to jump through state and federal historically-correct hoops to rehabilitate the roof. "Now, what were trying to do is we're trying to get it (right)," Schroll said on the contrary. "We're going to go back to the metal roofing, which we believe it originally had on it, so it looks historically correct instead of shingles." The shingles that currently cover the structure have expired their 20-year shelf life. Schroll said that volunteers helped with that effort back then, but he added "that's one thing." He hopes to "round up" experienced contractors, as well as ready hands, to bring the roof back to its original shape. He stressed finding someone who knows repairing structures to ensure the factory remains sound. Schroll and other historical sitings in the area have had conversations about a tourism trail that would take people to places like the Carthage jail or Nauvoo. "But we can't do that until its safe," Schroll said. Moses King purchased the land in 1876 hoping to use the land to mine coal. King's $150 parcel produced a considerable amount of excess coal, and he used what he could not sell to fire clay into brick. And so began the family business. In 1884, King put in his first two kilns. These massive bee-hive structures were able to reach upwards of 2,000 degrees to dry the clay bricks. However, on St. Patricks Day, about 15 years ago, according to Schroll, one of the eventual seven kilns that King would build "exploded." While in the house, Dev and Schroll heard a loud snap, followed by what sounded like bricks collapsing. "It was worn, the last band broke, and it turned into a pile quarter of a million bricks," Schroll said. "Just like that, two seconds," he added. The original kilns are still holding, but not strong. "This is a whole separate world when it comes to fundraising," Schroll said. Schroll and Dev have devoted themselves to the Brickyard, and Schroll said he has no idea why. Though, he said, it's Dev's passion, and to her it's worth it. "She saw beauty in it," Schroll said. The Brickyard has become a sort of sanctuary for those looking for one. People would take tours, work on art in the workshops, visit in the short-stay rooms, and contribute to the district’s lawn. Upon entering the brick-firing area, a "spiral" filed with burned, destroyed old bricks, glass bits from the furnace, and other small treasures lead the walker to "Mother Bear" – a concrete bear statue. Schroll wishes to restore the Brickyard, and help it further its own peculiar history. "The liability is just scary," Schroll said. On Monday, at the time of the interview, decent-seized patch of ground between the 1884 kilns stood concaved. Despite the work that still needs to be done, the factory is well on its way to being refurbished. Fixing up the 139-year-old historical district is a long strenuous take-on. Schroll, though, said that the place had its hold on him, and he and his wife will continue their work on it. Reach Jacqueline Covey via email at jcovey@McDonoughVoice.com, or follow her on Twitter @jacquelinecovey. Paper artifacts, including a book and a brief of the start of the Church of the United Brethren in Christ from 1926, were recently found after the McDonough County Health Department demolished the church building behind it on Jackson Street. MACOMB — On Sept. 4, 1926, The Macomb Daily Journal reported the replacement of Cumberland Presbyterian Church with a different denomination, new to the area — the Church of the United Brethren in Christ. The McDonough County Health Department recently stumbled upon remnants of the congregation, which was later collaborated with methodists, calling themselves the United Methodists. The department's administrator, Lynette Cale, said that while demolishing the old church, a heavy copper box — a time capsule — was revealed. The health department purchased the building at 509 E. Jackson St. last year after its former owner, David Linnenburger, passed away. Near the entrance of what was Shoot Stars Photography Studio and hidden behind overgrown brush sat the United Brethren's cornerstone, organized: Feb. 22, 1926. "When the demo team, Shawn Stoneking (Corporation), and they kind of suspected that there was something in there with the corner stone," Cale said. "So they were really careful when they took the cornerstone out. That was purposeful." The granite cornerstone had carved out a copper box-sized hole, where the time capsule slid in and sat for the last 89 years. The capsule holds records of the $5,555 exchange the Illinois Annual Conference made for the building. A committee branched off from the Conference, consisting of a Edward H. Shuey, to purchase the church for the brethren. The statement was documented in a brief of the start-up of the church, from Sept. 5, 1926: "The good people of Macomb and the ministers especially gave the finest support and much food was accomplished in the first meeting." A bell from the original church had also been rescued. Cale said that the contractors were careful to manage a hole behind the bell and pull it out with a crane. Other contents in the capsule include multiple magazine and newspaper articles from the year, list of the first school senior department, with Will W. Haggerty as superintendent, Daniel Cousins as assistant superintendent, and other similar memorabilia. For those who have more information, please contact Jacqueline Covey. MACOMB — In the spring of 1830, McDonough County settlers had the numbers to separate from Schuyler County and pioneer the area. Allen Nemec, president of the McDonough County Genealogical Society, gave his organization and the Historical Society a brief history of ensuing period entitled, "Pre-1870 Homes in Original Town Macomb," during a recent joint meeting. A filled room at the Spoon River College Community Outreach Center on May 18 allotted Nemec the space for his slideshow, which the The Carpenters’ song "Yesterday Once More" played over. In addition, the crowd listened intently to stories of the well-known, antebellum homes scattered around town. 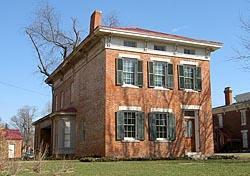 Built circa 1854, the home of the first mayor of Macomb at 329 S. Lafayette St. still stands. The folk home belonged to John O'Conner Wilson. It is a two-story folk home, which has since been stuccoed and stone-veneered, covering the original wooden frame. In the recent decades of the "eye-shaped" house, according to Nemec, it's been reconstructed into a four-apartment complex. Nemec said one could easily identity the home, whilst driving down Lafayette Street, by its single window on the northern side. After Mayor Wilson's failed farming attempt, he, his wife, Adeline, and their five children moved into the American Elm-lined Block 39 on the south side. "My husband was a good hatter, and thought he would make an equally good farmer – I thought so too," a 97-year-old Adeline wrote to the local newspaper. But 18 months had proved them mistaken. During this time, Wilson's endeavor to live off the land often times left his wife home alone. In her early 20s, Adeline and her husband lived some four miles southwest of Macomb in the "wilderness of woods and prairies" that overcame the area then. She wrote that she lived in "continuous dread" every time Wilson would left home. She was afraid, living in isolation where only smoke from far-off chimneys and rooster coos were signs of life, that stray bands of Native Americans would threaten her. "So we moved to Macomb, which even then didn't have over 50 houses in it, and this has been my home ever since," Adeline wrote. To give his crowd more of a historical setting, Nemec drew its attention to the lot's property tax value. "I only wish our taxes on our block remained at this level," he joked. For the 39 block in Original Town Macomb from 1862 to 1869, John Wilson paid between $800 and $1,500 for the entirety of the southern half of his block, and in 1870 the taxes dropped to $480. Nemec showed, as his presentation continued, that property taxes of that time were in constant flux. Just as 329 S. Lafayette St. was marked with a red star, which Nemec indicated as "Today's pre-1870 Homes," so was 341 S. Lafayette St., a home that was built for Elizatbeth Clark, the Wilson's daughter. Born in Macomb in 1834, Nemec called Lizzie a true early pioneer. In 1852, Mayor Wilson had the home built for his daughter and her husband Otto Frederick Clark. "Her husband is a mystery to me, " Nemec said, "because 'Otto Frederick' I could not find anywhere in my research where he was born, and all I can find is that he died prior to her in 1900." Strangely enough, Lizzie was listed as head of household at the age of 25 in 1860. Nemec also showed a census from 1870 showing Lizzie still in the home on the corner of South Lafayette and Piper Street. "Keep in mind they married in '52, so there is only an eight-year span when he is gone and out of the picture," he added. Please watch this video and help now! A year ago, I mentioned that our town once had a reputation for attractive residential areas, and there was significant public concern about stylish, well-kept homes. As all long-time Macomb townspeople know, we have suffered some residential decline in recent decades. 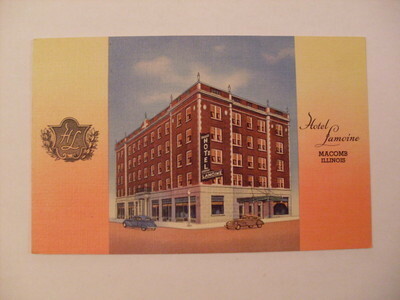 Along with articles on various local homes during that era, Nichols also reprints items on matters like “Macomb gardens and lawns,” “good sidewalks,” “elimination of [run-down] buildings,” and even a community-wide “Clean-up Week,” held in mid-April. That event featured not only volunteer efforts but a “Clean-up, Paint-up, Fix-up Parade,” filled with floats created by local organizations. As that newsletter issue demonstrates, community leaders were deeply committed to promoting home beautification efforts. The May meeting of the Historical Society is next Monday evening at 7:00, and it will be held at the Spoon River College Community Outreach Center on East Jackson Street. There is also a potluck dinner for all who come early, at 6:00. The meeting will be a joint gathering with the McDonough County Genealogical Society, and the latter’s president, historic home expert Allan Nemec, will speak about “Original Town of Macomb, Pre-1870 Homes”—illustrating his comments with photographs of those houses. Former mayor and AMTRAK official Tom Carper will also speak briefly on the current issue of Macomb’s railroad service. The public is invited to attend, and information about membership in both organizations will be available. I should mention, too, that another group which continually presses for home awareness and upkeep is the Macomb Beautiful Association, currently headed by Penny Yunker. Their annual effort to recognize attractive homes, and businesses, through the Macomb Beautiful Awards program, is set to begin for 2015 this month. Signs at this year’s selected homes will go up in midsummer, and a fall banquet will be centered on those award winners. Also, the MBA will have its first annual Macomb Garden Walk this year. That is set for Saturday, June 13, and will feature self-guided tours of ten outstanding lawn-and-garden areas. Advance tickets for that fundraiser are just $10, and various MBA members are selling them, including Penny Yunker and my wife, Garnette. The Yunker home, a modern brick building, set on several acres, at 1901 Riverview Drive, and our home, a 90-year-old Georgian Revival house, located at 404 South Edwards Street, both have yards on the Garden Walk, but there will be lovely lawns to tour in many areas of town. The starting location for that event will be the historic Macomb Railroad Station. For those interested, MBA membership information will be available there, too. That Garden Walk will be a good opportunity for local people with an interest in home styles, lawn and garden areas, and neighborhood upkeep to interact with others who care about those matters—and about the long community tradition of residential beautification. I believe that most people who cherish older homes, and who work to have attractive homes (whether historic or modern), feel that way. Too often, owners who don’t maintain their homes are also people who don’t care what happens to their neighborhood or their town. In short, our homes often speak volumes about our way of life, and our values. And that’s why home and neighborhood upkeep efforts, by city leaders, Historical Society members, Macomb Beautiful members, and others, are not just economically beneficial for local homeowners but crucial to satisfying personal experience for all residents and to the long-term success of community in Macomb. It is indeed time to re-emphasize our tradition of home preservation, appreciation, and beautification. 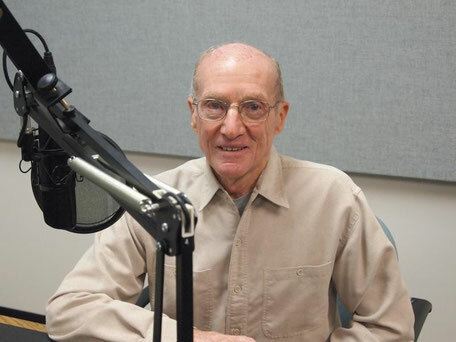 Author and local historian John Hallwas is a columnist for the McDonough County Voice. The McDonough County Historical Society is now on Facebook! will hold their first joint meeting. of the Spoon River Community Outreach Center on East Jackson Street. Please bring table service and a dish to share. illustrated with a PowerPoint presentation. An authority on local historic homes and author of Macomb Homes with Names: A Look into Macomb, Illinois’ Historic Homes, Their Past Inhabitants and a View of them Today, Allen will talk about the early residents of each of these homes and their contributions to early Macomb. and will welcome questions afterward. After the program, the two societies will hold individual business meetings. Colchester Area Historical Society will meet Tues. April 21, 2015 at 7 P.M.
at Colchester City Hall Community Room at Friendway Park. “Two Hundred Years of Technology in School”. All interested individuals are invited to attend. The building in downtown Macomb will be converted into an assisted living facility. Newly drawn construction plans show it will feature 47 rentable studio and one bedroom apartments as well as a memory care unit. Developer Chris Trotter is working to raise private investments to pay for the $4.5 million project. Mayor Mike Inman said Trotter is close to obtaining his goal. Inman said he would like the city to chip in by allocating about $750,000 worth of TIF money. That’s a loan Trotter would need to pay back. As part of the incentive package, a portion of an adjacent city parking lot would be given to the facility. The city council will need to sign off on the TIF money and the parking lot proposal. The city has already given Trotter about $200,000 worth of TIF money. That was awarded after Trotter purchased the building for $150,000 and replaced the roof for an additional $100,000. The building’s façade will mostly be kept the same to maintain its historic integrity. The only change will be the addition of a wheelchair ramp to the back door of the building. The interior has already been gutted and will be completely rebuilt to accommodate the newly drawn floor plans, which include adding a stairwell and enlarging the elevator. The building is in Macomb’s historic downtown district so it's also eligible for a 20% income tax credit. But to maximize that credit, the interior of the building would have needed to be rehabbed instead of rebuilt. Construction will take about a year and could begin this fall or next spring. Trotter plans to hire a third-party health provider to manage the facility. Inman said the city is excited about the project even though it isn’t the exact project he hoped for. “Ideally the city had looked for a developer there that would have been a residential component on the upper floors, (and) commercial, business, retail on the first floor. At the end of the day that was our true hope for that building. But the fact of the matter is we couldn’t find someone to partner with on that idea,” Inman said. But Inman said he is looking forward to the extra foot traffic the facility will bring to the downtown. He said Trotter has completed two market analyses in the last two years that sustained his business model. “He (Trotter) believes that there is a demand for this type of health care and residential living development for the elderly and he believes it works for him as a business model," the mayor said. A historical marker will be placed next to a former piece of playground equipment in Macomb. 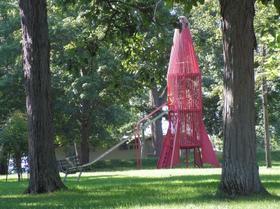 The red rocket in 2003, before the slide was removed. The red rocket slide was installed during the 1960s. “One of the reasons why it felt near and dear is that I remember that as a kid,” said park board member Pat Sowers, who came up with the idea for the plaque. The red rocket was decommissioned as a piece of playground equipment a few years ago. The Park District said it did not meet today’s safety standards. The slide was removed but the district kept the rocket part of the piece in place. “I hope other people have the same memories and other people can enjoy it,” said Sowers, who called the red rocket a piece of art. The stone shelter in Glenwood Park was a WPA project from the Great Depression. The red rocket slide is not the only historic structure in Glenwood Park. 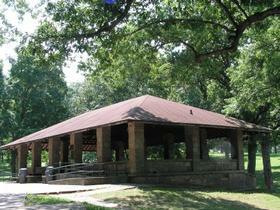 The stone shelter dates back to the Works Progress Administration of the 1930s. It was put together with parts of streets that were being rebuilt in town at the time. The park board voted 4-0 in favor of placing the historical marker next to the red rocket. President John Hemingway noted that not all of the local history in Macomb is on the courthouse square. Illinois' Governor has posthumously pardoned three men for their work with the Underground Railroad. The men all lived in west central Illinois and were convicted more than 170 years ago based on laws that prohibited helping runaway slaves. Those laws remained in place even after Illinois abolished slavery in 1824. Dr. Richard Eells was from Quincy. He agreed to help a fugitive slave get to an Underground Railroad site but the slave was caught and Eells arrested. He was convicted and fined, but remained a leader in the abolitionist movement and helped hundreds of other enslaved African Americans escape to freedom. Governor Pat Quinn also pardoned Julius Willard and his son Samuel. They helped a woman reach the Underground Railroad from their Jacksonville home. The Willard's were also convicted and fined. Illinois Lieutenant Governor Sheila Simon and her staff worked with historians and legal interns to prepare clemency petitions in the cases. Lt. Governor Sheila Simon applauded Governor Quinn’s action today to grant clemency to abolitionists who were convicted for their anti-slavery efforts. Simon filed petitions last year seeking clemency for three abolitionists convicted during the 1800's. Simon’s work to clear the names of abolitionists began after being contacted by Quincy historians. Simon’s first petition of clemency was filed for Dr. Richard Eells, who in 1843 was convicted of harboring a runaway slave. Eells, an Underground Railroad conductor, was found guilty of harboring and secreting a runaway slave, and unlawfully preventing the lawful owner from recovering the slave. His case was later heard by the United States Supreme Court, which upheld the original conviction. Through his involvement in the Underground Railroad, Dr. Eells helped numerous slaves traveling through Quincy toward Chicago, and ultimately, to freedom in Canada. The National Parks Service has declared Dr. Eells’ home as one of the country’s 42 most important Underground Railroad sites, and the home is currently operated by the Friends of Dr. Richard Eells House. The Chicago-based Abolition Institute, which is committed to fighting modern day slavery worldwide, honored Lt. 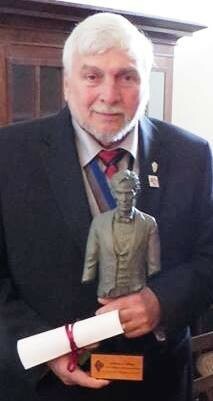 Governor Simon on Abraham Lincoln’s birthday for her work fighting for clemency for Illinois abolitionists. Simon also filed petitions of clemency for Julius and Samuel Willard who in 1843 were convicted of secreting and harboring a fugitive slave. Julius, who was close friends with anti-slavery activist Elijah Lovejoy, moved his family from Alton to Jacksonville while their son Samuel attended Illinois College. Dr. Samuel Willard later served in the 97th Illinois Regiment, participating in the Battle of Vicksburg. An illness contracted during his military service caused partial paralysis, and Dr. Willard was never again able to practice medicine. Instead, he became a lifelong education advocate, working to establish the Springfield Public Library and libraries across Illinois, as well as becoming the superintendent of the Springfield Public School District. Despite Illinois residents voting to abolish slavery in 1824, both Illinois and federal law prohibited the harboring or assisting of runaway slaves in free states. Simon’s office worked with historians and experts around the state to identify Illinoisans who were convicted of violating slavery laws.